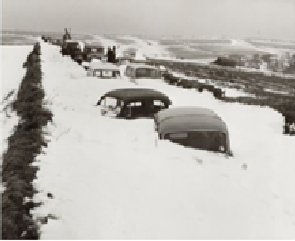 Boxing Day 1962 brought blizzards to the South West of England and by January 1963 the West Country was blanketed with snowdrifts up to 18ft deep in places. The big freeze – the worst winter weather Britain had seen for 200 years – was to last from just after Christmas in 1962 until March 1963. Only the Tamar bridge linked Devon with Cornwall. All other roads between the counties were closed due to snow. Helicopters were called to assist people trapped in North Devon. According to weather reports from the time there was a very brief thaw on January 4, but it came too late to save all but five of the 32 FA cup ties planned for the day, which had been postponed. And as temperatures dropped once more the crisis caused by the bitter cold began to seriously impact on farmers, not least because wild animals and birds, unable to get at their natural foods, were attacking stored grain and other crops. A report from the time reads: “The Ministry of Agriculture advised farmers to shoot house sparrows on site now that they were in their hundreds seeking food in farmyards.” There would be no such crisis involving sparrows today; in the intervening half century their numbers have plunged. 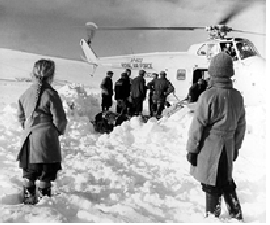 By January 6, 1963 – a Sunday – the snow was back with a vengeance. It was reported a total of 1,300 sheep, ponies and bullocks were dug out of drifts on Dartmoor, while at sea a coaster missing since December 28 on a voyage from Swansea to northern France was found off Lands End. The rest of January was just as bad, though there must have been high hopes that the weather would improve, at least in the South West. On January 8 it was decided to move the final England Rugby Union trial from Twickenham to Torquay, where “things might be balmier”. Balmy would not be the way residents of Exmoor described the winter. By mid January it was reported that Porlock Hill, a challenging gradient even in good weather, had been closed for a total of 21 days because of ice and snow. And it was to get worse before it got better, with rural areas bearing the brunt. Toni Buchan as a young girl remembers it well – “Snow started to fall on Boxing Day 1962 and was still lying in places where it had drifted at Easter. In the middle of February there was a big dump of snow together with strong winds. The roads quickly filled up with snow. The last bus to leave Ilfracombe for Barnstaple was about 4 p.m. I remember arriving home looking like a snowman after walking up Fox Hill into driving snow. A later bus to Woolacombe could not get through and passengers transferred to the train. Abandoned cars were lost in snow drifts on the A361 which delayed clearing by snow plough. The next day, February 6, the Devon River Board chief engineer said in a broadcast that he expected rivers in the county to burst their banks within 24 hours. Police dynamited ice on the Exe to prevent flooding and children were evacuated from a school at Crediton. Floods were averted in most parts of Devon, though, as the ice refused to loosen its grip. Eventually, however, the beginning of a thaw was recorded. On February 14 – Valentine’s Day – it was reported that “Devon got its floods at last” and so did other parts of the West Country. There was 4ft of water on the Crediton-Okehampton road, 3ft between Exeter and Bridgwater, and the same depth on roads between Taunton and Langport. The Army sent in eight DUKWs – amphibious trucks – to Taunton where cars were stranded in the flood water. But by February 17 in the South West hopes rose on a day of brilliant sunshine. For the first time since Christmas all main roads were open across Dartmoor. On March 2 troops relieved a farm on Dartmoor which had been cut off by 20ft snow drifts for 66 days and three days later the first frost-free day across Britain since Boxing Day was reported. The big freeze was over.